With Spring just around the corner and the sun peeking out every now and then, why not break out the grill?! 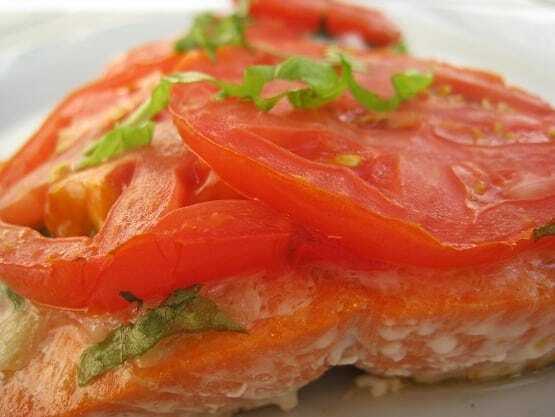 This delicious Grilled Salmon Recipe with Tomatoes and Basil not only looks beautiful, it tastes great and is super healthy. The fresh tomatoes and kick of garlic and basil add a lot of zing, and give some life to the salmon. I’m typically not a fan of salmon recipes, or salmon in general, but it’s soooo good for you, and so I force myself to try out a variety of Weight Watchers salmon recipes whenever I can. And I have to say that I really, really enjoyed this dish. It tasted so light and fresh, and was the perfect weekend dinner idea. Each serving has just 5 Points, and the recipe involves very minimal ingredients, so it’s a great healthy meal option in a pinch. Enjoy! Preheat grill to medium. Mash minced garlic and 3/4 teaspoon salt in a small bowl and stir in oil. Measure out a piece of heavy-duty foil (or use a double layer of regular foil) large enough for the salmon fillet. Coat the foil with nonfat cooking spray. Place the salmon skin-side down on the foil and squirt the lemon juice all overs it. Then spread the garlic mixture all over it. Sprinkle with about ¾ of the basil. Overlap tomato slices on top and sprinkle with the remaining salt and pepper. Transfer the salmon on the foil to the grill. Grill until the fish flakes easily, 10 to 12 minutes. Use two large spatulas to slide the salmon from the foil to a serving platter. Serve the salmon sprinkled with the remaining basil.